Aliens Attack! When science-camp buddies Kevin, Warner, Tara, and TJ summon alien life to earth, they quickly find out that not all extraterrestrials come in peace. Can they stop an alien takeover and save the world in time to win the Invention Convention? John Kloepfer, author of the popular Zombie Chasers books, has done it again. 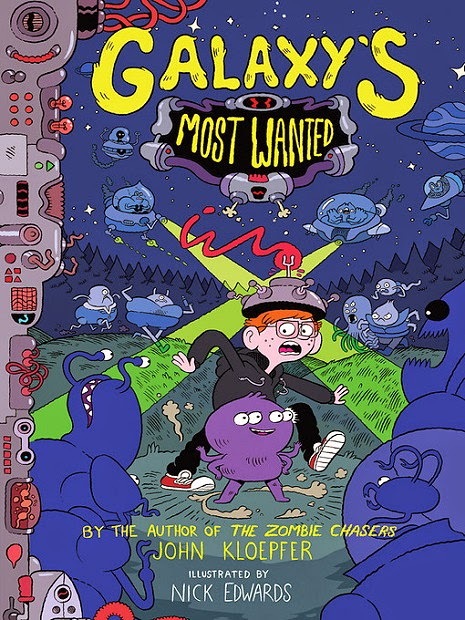 Galaxy's Most Wanted has a fast-paced, silly plot full of sidesplitting descriptions, a cast of diverse and endearing characters, and a slew of creepy-crawly aliens oozing off the page. With out-of-this-world black-and-white illustrations by Nick Edwards throughout, the first book in this new series is going to blast off! Kevin: Science genius. Physics, biology, chemistry, you name it, Kevin can do it. He's the brains of the operation, leader of the crew. Warner Reed: Kevin's best friend and resident cool dude. He's the guy to see if you've got a 2:00 a.m. junk-food craving—but you'll pay top dollar for his top secret stash. TJ Boyd: Computer problems? He's your man. TJ's a regular computer-programming prodigy. He's not much of a talker, though. Word around the campfire is that he damaged his voice box in a botched robotics experiment. Kevin Brewer, Warner Reed, Tara Swift and TJ Boyd are best friends at Northwest Horizons (S)cience (T)echnology (E)ngineering and (M)ath camp. They need an awesome project to win the Invention Convention, a contest at the camp that has been won by Alexander Russ the last few years mostly because his father “helps” him. While reading the comic book “Brainstorm” by Max Greyson, they find blueprints for a galactoscope. A galactoscope is an instant messenger across the entire galaxy. It turns out that they can build it! After completing the galactoscope they send out a message to the galaxy. Many hours later a portal opens up and a spaceship comes out. An alien comes out of the spaceship. Mim, the alien, is running away from space poachers. Later that night another alien comes through a portal looking for Mim. Mim is able to avoid being found on Earth with the help of the kids. Soon after, 5 more aliens arrive to try to capture Mim. Mim and the kids destroy 4 of the aliens and the fifth is shrunk. The captured alien, Klyk, claims that Mim is the real bad guy of the galaxy. Oh no!! One of my favorite parts of Galaxy’s Most Wanted is Tara Swift. She was the one who made the galactoscope work and she always protects the boys when Alexander picks on them. Next is the setting. It is set in the forests of Oregon. It is so pretty there and one of my favorite places to go. Another great thing about the book is the suspense. I really like how some chapters end with a cliffhanger. It really adds to the anticipation and makes you want to read the next chapter immediately. I will be looking forward to another book along the lines of Galaxy’s Most Wanted. It was awesome and can’t wait to read more by John Kloepfer.